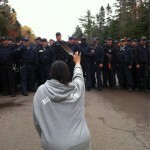 El tercer campamento en el Territorio de los Mi’kmaq, en la Autopista 11, donde ha ocurrido los enfrentamientos entre el pueblo Mi’kmaq protegiendo el agua y el RCMP (Policía Montado Canadiense Real) protegiendo los intereses de las corporaciones, está pidiendo el apoyo mundial a nivel general. El Tribunal Provincial de New Brunswick ha aprobado un mandamiento judicial que nombra 5 personas, incluso “Jane” y “John Doe”, para fijar como objetivo al campamento de la Autopista 11. El campamento ha bloqueado con éxito el paso de los vehículos de SWN y está impidiendo la conducta de pruebas sísmicas por SWN en las tierras no cedidas de los Mi’kmaq. Cada día en que SWN no puede conducir sus pruebas, la compañía pierde $540,000. SWN está pidiendo de nuevo a el RCMP que haga cumplir el mandamiento más reciente cedido por el Tribunal. A esta hora, el RCMP ha utilizado el mandamiento para fijar los Mi’kmaq como objetivo y ha establecido un punto de control en la Autopista 11, donde los RCMP pueden parar los vehículos y detener a los conductores y pasajeros cuando quieran. Recordamos la última vez en que el RCMP hizo cumplir un mandamiento contra el pueblo Mi’kmaq. Como hemos visto históricamente, el RCMP continuará imponiendo la violación de los tratados y atacando la autodeterminación Indígena. A esta hora, los RCMP no sólo están hostilizando los Mi’kmaq Defensores de la Tierra y los aliados no Indígenas, sino están siguiendo encarcelarlos. El jueves, 28 de noviembre los Mi’kmaq bloquearon el paso de SWN otra vez – declarando un día más de victoria. Se están levantando contra la represión brutal de la policía, y el robo de tierras Indígenas y la colonización que siguen en desarrollo. ¡Demuestren a ellos que no están solos! Le troisième campement en territoire Mi’kmaq, à HWY 11, lequel a vu les confrontations entre les Mi’kmaq qui protègent leur eau et la Gendarmerie Royale Canadienne (GRC) qui protège les intérêts corporatifs demande un support répandu et global. La cour provinciale du Nouveau Brunswick a approuvé une injonction qui identifie 5 personnes, incluant “Jane” et “John Doe”, afin de cibler le campement HWY 11. Ce campement a repoussé avec succès les véhicules de SWN et a empêché la compagnie de réaliser les tests sismiques sur des terres Mi’kmaq non-cédées. Chaque jour que SWN n’arrive pas à faire ses tests, la compagnie perd 54 000$. SWN essaie encore une fois de forcer l’injonction qui lui a été accordé. À tout moment, la GRC a utilisé l’injonction pour cibler les Mi’kmaq et ont mis en place un point de contrôle sur HWY 11, où ils arrêtent les véhicules, passagers et conducteurs. Rappelons-nous de la dernière fois que la GRC a fait appliquer une injonction contre le peuple Mi’kmaq. Comme le montre l’histoire, la GRC va continuer d’assurer la violation des traités et d’attaquer les droits d’autodétermination des autochtones. En ce moment, la GRC ne fait pas qu’harceler les résistant-e-s Mi’kmaq et leurs supporteurs non-autochtones, mais continue à les jeter en prison. Le jeudi 28 novembre, les Mi’kmaq ont encore une fois repoussé SWN, déclarant un autre jour victorieux. Ils sont en train de confronter la brutalité de la part de la police, et continue a voler les terres des pays autochtones et continuent le processus de colonization. Montrons leurs qu’ elles-ils ne sont pas seul-e-s! Thank you for your sacrifices to protect your land and everyone’s elses. Your determination is inspiring, I wish I could support you by being there but I am practicaly on the other side of the country. I am there in spirit. organize something in your community!! I can’t believe this is happening in Canada. I wish our society wasn’t driven by consumerism, but unfortunately money is the only monetary value the Canadian government sees from its people. Please let me know how I can be involved here in Ontario. I want to help any way I can. For the past 521 years the colonial powers and their ancestors have been systematically stealing the rights and the land of the indigenous peoples. This physical action should be supported and the corporate land grab should stop. The people have the right to peaceful enjoyment and self determination to their lands. Pingback: Masked RCMP continue to enforce the violation of treaties and attack Indigenous self-determination | On First Nation Issues, Events, And Environmental Issues On The West Coast And World Events. The ever-increasing, industrial assault on our planet must end. Thank you so much for all of your efforts. I believe I am part of a vast silent majority who support you completely. Come and stand with us in support and solidarity of our relations defending the Land and the Water in Elsipogtog. Harper will be in Toronto tomorrow for his appearance on Breakfast Television, where he will plug his new hockey book. We ask you to come and join us in solidarity where Harper will be. Yes, it is early to be out there on the streets, but that is nothing in comparison to what is happening to our defenders in the East, or defenders anywhere for that matter. We also ask for your support in boycotting this book or any book he writes. work together in an effort to boycott Harper’s book. If anywhere we should show our support for our Relations in Elsipogtog, it should be right outside the studio where he will be. Stand strong in defence of the land, I tautoko you (support) you and wish you all the best what you are doing is morally right and I hope that God blesses your endeavours. Thank you for your work to save your land and our planet! I pray for peace and undestroyed nature (and some warmth, too). Respect… protect your mother earth, your land, your children, and yourselves! Thank you all for your endevers in protecting me….prayers for all of you. We’re with you in Chicago, Illinois. We are with you in Minneapolis, MN and increasing our numbers. Thank you for teaching that the ..Natural Laws.. come first. Natural laws always trump Statutory laws. Looking for ways to get involved with solidarity in Seattle. Bless you! Thank you for standing strong, my family and children are in support of all of you, never stop fighting, don’t give up hope, you are an inspiration to us all and an example of the power of direct action! Brave First Nations People…we stand with you, and will do what we can from here in Florida, where we are also fighting to protect our land and water from corporate exploiters. We wish you continued courage, and send you our prayers and hopes. Thank you for your commitment: you are an inspiration to all of us! I believe we need to sue the government and the police for unlawful acts regarding freedom of expression, freedom to assemble, freedom to rally, etc. Why are they allowed to break the laws, I thought they applied to everyone. Why are the police and the government allowed to harrass people who are lawfully demonstrating, assembling, etc.? Don’t the laws of freedom supercede governments’ agendas? The RCMP and the government should be charged in a court of law of subverting personal freedom. Idle No More Winnipeg came out in support yesterday afternoon and evening, right in front of Portage Place. 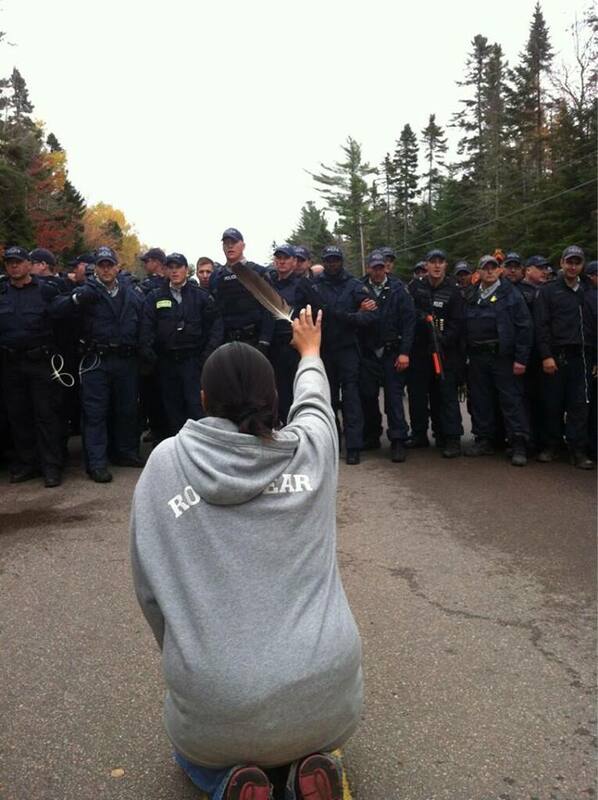 SWN + RCMP out of Elsipogtog territory NOW!! All peoples who honor the land should be with you. or send your kids to school on a “split estate,” you’re in trouble. mineral rights, is authorized to march onto private (or public) property and start drilling. The most offensive part is that not only can a landowner do nothing to stop them (and I am proud of you for taking a stand), there are also dangerously few regulations on how the process is carried out—and it’s one that is both toxic and resource-intensive. Not to mention noisy and smelly. The process of extraction often involves hydraulic fracturing, or fracking, which was developed by the oil and gas industry to access oil and gas in deep underground wells. Chemicals and massive amounts of water are injected into the ground to cause fractures in the rock, which then allow increased access through a borehole to the gas reserves. For oil and gas companies, some laws don’t apply. – Because of loopholes in the Clean Air Act, oil and gas wells are not subject to restrictions on hazardous air pollutants. Garfield County, Colorado, for example, a site where a lot of fracking has taken place, has shown elevated levels of several hazardous air pollutants. NRDC report points to Aztec, New Mexico, where two wells were installed less than 400 feet from an elementary school—and less than 150 feet from the school playground. Complaints of fumes on the playground and in the school are frequent—and the health risks are hazardous, even if the industry continues to dispute them. Contamination is not the only issue: the massive quantities of water consumed by fracking also raise concerns, especially in the west, where water scarcity is already a fast-growing problem. With between 3 and 9 million gallons of water pumped per well and the water table already dropping, the battle over water supplies is not likely to be without a controversy of its own. On top of it all, the water is pumped at intensely high pressure, and minor explosives are used (they are breaking through layers of rock, after all), which means the earth’s very foundations are, by design, weakened. Some suggest that fracking can cause earthquakes, pointing to Colorado and Texas in particular as proof of that. Then, as a result of earthquakes comes additional contamination—tiny earthquakes in Denver, for example, disturbed the city’s aquifer, because who can predict ahead of time where the chemicals will end up. As a result, the aquifer has never been used and the city has turned instead to the western slope for water. It is time to act on this conflict over land for resources is no longer just an overseas issue, or even one that affects people on the other side of the country. There are oil and gas operations now in 32 states and they’re only looking to expand. It’s important for those “states and cities and counties to look at what they can do to help surface owners protect their land and their values. Because—the federal government doesn’t have a great track record in doing so; and it’s not as though Washington isn’t aware of the issue. Many of the conflicts have involved federal ownership on one side or the other: either the land is public and private interests want to drill, or private land owners are in dispute with government rights to minerals under their land. It hasn’t been a partisan issue: There have been officials from different parties that have supported exemptions for the oil and gas industry… politicians from states where there is a large energy industry often support measures that are beneficial to the industry. But there’s hope: public momentum is gathering as awareness grows, and efforts are still being made to increase federal regulations. The currently pending Fracturing Responsibility and Awareness of Chemicals Act, or FRAC Act, seeks to “repeal the exemption from restrictions on underground injection of fluids near drinking water sources granted to hydraulic fracturing operations,” as well as require disclosure of the chemicals used during fracking.